Chief Justice of the United States, William Rehnquist, has died at his home in Virginia at the age of 80. 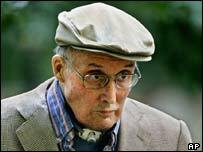 Mr Rehnquist - a conservative who had served on the court since 1972 - had been suffering from thyroid cancer. A Supreme Court spokeswoman said there had been a "precipitous decline" in his health over the past few days. His death creates a rare second opening on the nation's highest court in just four months following the retirement of Justice Sandra Day O'Connor. William Rehnquist was first diagnosed with cancer in October and had been in and out of hospital ever since. Although he appeared increasingly weak, and had to breathe with the help of a tube at President Bush's inauguration in January, he continued to work. Quashing rumours of his retirement, he said in July he intended to "continue to perform my duties as chief justice as long as my health permits". He died at his home in Arlington, Virginia, surrounded by his three children, the court said. White House spokesman Scott McClellan said President Bush and his wife had been "deeply saddened" by the death. The president was expected to make a statement on Sunday morning. The death of America's most senior judge provides President Bush with another political battle at an already difficult time, says the BBC's Jonathan Beale in Washington. He already has a fight on his hands pushing through his nomination to replace Sandra Day O'Connor, the moderate conservative John Roberts. Mr Roberts' senate confirmation hearings were set to be held this week, but could now be postponed. William Rehnquist was politically attuned to Republican politics, says our correspondent. He was nominated to the Supreme Court in 1972, and appointed the nation's 16th chief justice by Ronald Reagan in 1986. He championed states' rights, supported the death penalty and opposed abortion. During a remarkable career, he oversaw the court's conservative shift, presided over President Bill Clinton's impeachment hearing in 1999 and helped decide the controversial election of George W Bush as president in 2000. However, he was regarded as an efficient administrator, able to work with those who did not share his views. 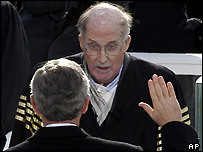 Speaking in 2004, William Rehnquist said he had not regretted a moment of his 33 years on the court. "Well, I think it's a very good job. One of the most appealing things about it is that... it enables you to participate in some way and to some extent in the way the country is governed but you're able to maintain a private life as well," he said. The nine-seat Supreme Court is one of America's most important institutions and judges are named for life. Its key responsibilities are to examine laws and government actions to ensure they do not violate the principles laid down in the Constitution. Its future direction is likely to be the subject of an intense battle in coming months as Democrats fight to stop President Bush giving the two seats to conservatives.